We live on a rocky little planet perfectly situated around a middle-aged G2 spectral type yellow star. In many ways, a very boring and ordinary star, but with an extraordinary difference: it has at least one habitable planet. And, in fact, one inhabited world with the right temperature and ratio of water to land to enable and maintain life. How many other planets are out there that might also be suitable for life? Our planet lies in the so-called habitable, or “Goldilocks”, zone of our star. It is called this because it’s not so close to the star that it’s too hot for life, and not so far away that it’s too cold. Instead, it’s “just right”. Within this habitable zone, the surface of any planets present are expected to have temperatures suited to liquid water, and so may be conducive to the formation and development of life as we know it. However, the habitable zone is not necessarily static. This is because stars, including the sun, are known to change in luminosity over their lifetime. For example, our sun is thought to have been up to 30% fainter than its present luminosity when it was younger. As a star increases in luminosity, the limits of the habitable zone moves further away from the star. More information on what makes one Earth-like planet habitable and another not can be found in a recent Conversation article. 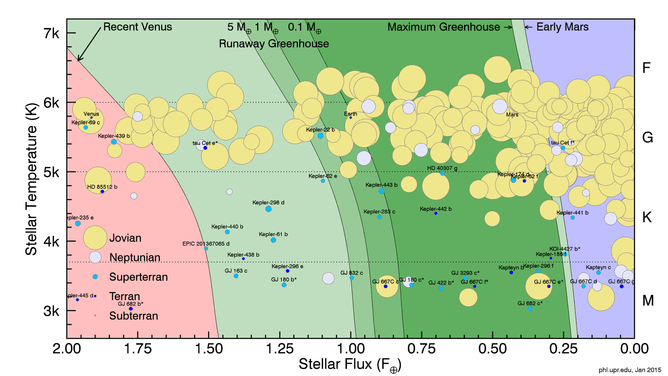 The figure above shows all planets near the habitable zone (green shades). Only those less than 10 Earth masses or 2.5 Earth radii are labelled. Some are still unconfirmed (* = unconfirmed). The different limits of the habitable zone are described in Kopparapu et al. (2014). Size of the circles corresponds to the radius of the planets (estimated from a mass-radius relationship when not available). Another important factor that influences whether a world can support life is the type of star that the planet is orbiting. Stars are classified according to a system developed by Henry Draper and Annie Jump Cannon at Harvard in the early 20th Century, and generally reflects stellar temperature. Stars are broken up into seven larger categories, based on colour and hence temperature. O, B and A-type stars are very hot and short-lived. Stars of types of G, K and M are cooler and longer-lived, with F-type stars considered on the boundary between hot and cool. So stars follow a hot-to-cool temperature sequence: OBAFGKM. The basic classification of stars according to temperature is known as the Harvard System and within the same spectral type, stars can vary widely in luminosity, which differentiates stars like our relatively modest luminosity sun (a main sequence dwarf) from high luminosity giant and supergiant stars, such as Antares. F spectral type stars, such as Canopus or Procyon, have surface temperatures of around 6,000-7,500 K. They sit in the middle of the scale, and are slightly more massive and hotter than our sun. Until recently their increased ultraviolet radiation has made them less attractive as potential host stars for habitable planets. Nevertheless, F stars do have a wider habitable zone that sun-like G dwarfs, so at the outer limits of the this zone the UV radiation from an F star may not be a major detriment. Over the past few years, M dwarfs have become a major focus in the search for habitable planets. M dwarfs are considered to be the most populous stars in our galaxy. They are also the coolest of the common type of stars, with surface temperatures below 3,500 K.
M dwarfs have much smaller habitable zones as they are much cooler. Their inner limits are also far closer to the star, meaning that their planets are closer to their stars and so are easier to detect. The transit method of searching for planets can detect smaller planets around stars with smaller radii, and using the Doppler technique smaller planets can be detected around smaller mass stars. Despite the vast number of M dwarfs in our galaxy and prospects for finding their planets, not everyone agrees that M dwarfs make good targets in the search for habitable worlds. Tidal locking of a planet around an M dwarf typically means perpetual day on one side of the planet and perpetual night on the other, and it remains unclear that life could survive on such a world. In addition M dwarfs produce flares and other activity that could sterilise the world. A paper released today in Nature Geoscience suggests another issue for otherwise promising M dwarf planets. This new paper discusses the evolution of young M dwarfs and the effect of their changing luminosity on their planets. Since M dwarfs experience an extended decline in luminosity early in their evolution, the habitable zone moves much closer to the star. This means that a planet that is in the habitable zone during the star’s middle age was once baked by a much more luminous host. Such planets would likely be “desert” or water-poor planets. At the other extreme, a planet with enough water initially to survive desiccation would likely have too much water for continents, and thus could suffer nutrient deficiency. So neither type of planet is a strong candidate in the search for habitable worlds. While there may be ways around these problems (such as outgassing of a watery secondary atmosphere through volcanism, or cometary impacts), this modelling suggests that our primary focus on the search for life should be on stars more like our own Sun. These are artistic representations of all the planets around other stars (exoplanets) with any potential to support surface life as we know it. 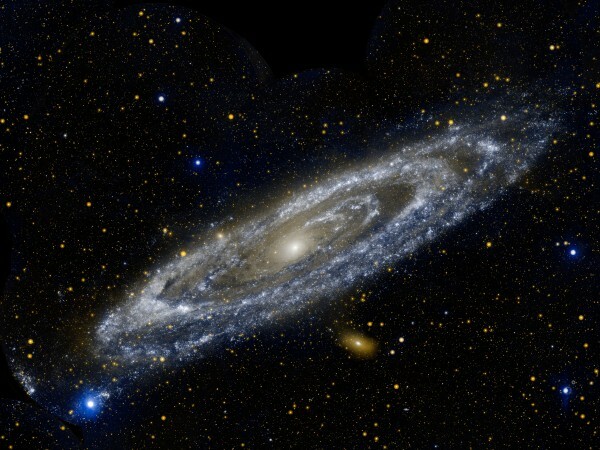 Most of them are larger than Earth and we are not certain about their composition and habitability. They are ranked here from closest to farthest from Earth. This selection of objects of interest is subject to change as new interpretations or astronomical observations are made. Earth, Mars, Jupiter, and Neptune are shown for scale on the right. 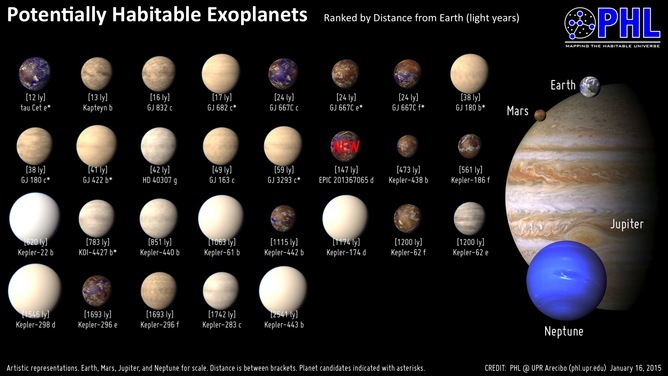 According to researchers at the Planetary Habitability Laboratory, there may already be as many as 29 potentially habitable planets currently known (although this figure remains the subject of much debate). Of these, 13 planets are around K-type stars, 14 are around M-type planets and two are around G-type stars. Ten are believed to be Earth-sized and the other 19 are considered to be super Earths. Today’s paper reported in Nature Geoscience suggests that future efforts should focus on the solar-type G and K stars rather than their smaller and more common brethren, the M dwarfs.